Step 1 Heat the oven to 350 degrees. Lightly butter a 15-by-11-inch baking dish with a little of the melted butter and set aside. Step 2 Bring a large pot of lightly salted water to a boil and add the noodles. Cook the noodles according to the package directions, then drain and set aside. Step 3In the bowl of a stand mixer, or in a large bowl using a hand mixer, beat the egg whites to stiff peaks. Set aside. Step 4In a separate large bowl, beat the egg yolks together with the sugar, cottage cheese, sour cream, milk, vanilla, the rest of the melted butter and 1 1/2 teaspoons of salt and one-half teaspoon of pepper, or to taste. Step 5Fold the noodles into the egg yolk mixture, then gently fold in the egg whites, one-third at a time. Step 6Spoon the mixture into the prepared baking dish and cover with the crumbled cornflakes. Sprinkle over the cinnamon sugar. Step 7Place the baking dish in the oven and bake until the custard is set, 35 to 45 minutes. In Recipes-list.com we have selected the most viewed recipes from category - Desserts . Enjoy the best recipes specially selected for you! 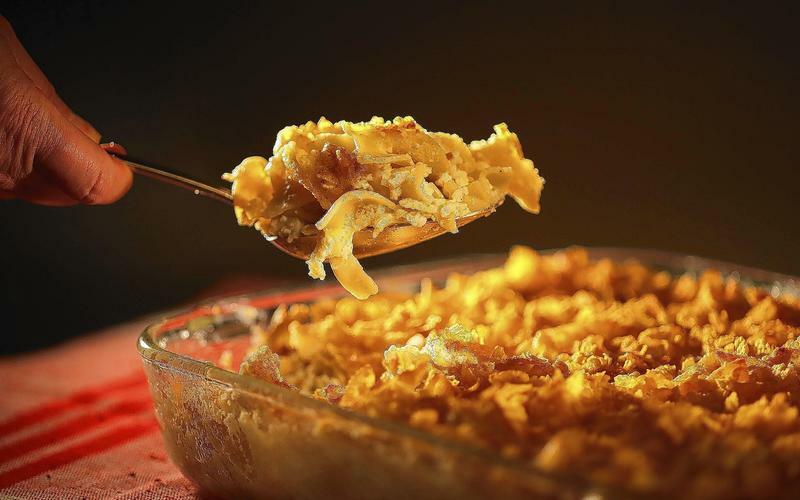 Brent's Deli's kugel is the right choice that will satisfy all your claims.